Thank you so much for the get-well wishes. The illness seems to have left us, more or less, and I didn't end up getting sick myself, really. A sniffle, a scratchy throat...it was to be expected. But nothing terrible, and we're back to normal today. I'm helping in the GB's classroom today, with art projects to share in December at our school's annual art/writing event. At home, I'm working on numerous (too many) projects, and I'm starting to wonder whether I'm crazy or just really into making stuff...anyone up for a Venn diagram? I've been working away on my Maggie Rabbit kit. The soft toy itself is very nice to work on. The clothing, on the other hand, is not easy for me. I decided to make a sample of the dress before cutting into that lovely Liberty lawn (the first I've ever held in my own two hands). I know I would botch it terribly without practice, so I've been working on a little calico sample. 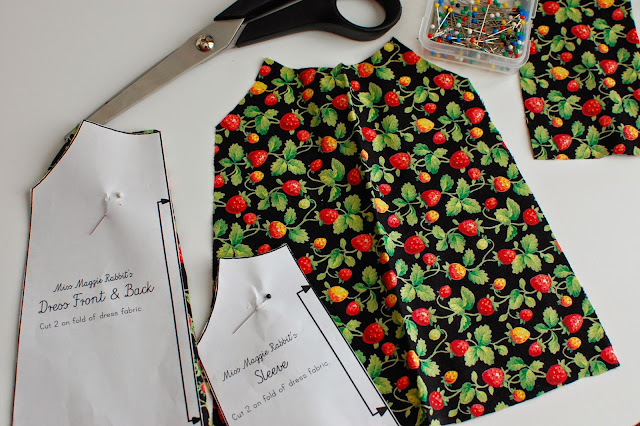 I think that the dress will fit one of the GB's baby dolls so if my sample comes out nicely enough, Miss Nellie will have a darling new strawberry-strewn frock...and Miss Maggie will look okay too. 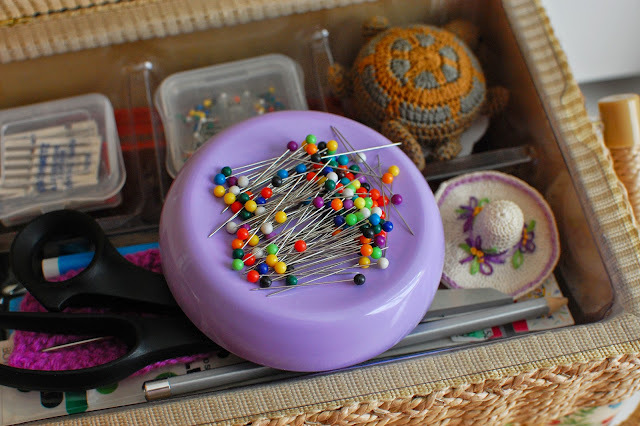 I bought myself some more sewing pins this week. I really like this size, both for the pin length and the larger ball heads. My magnetic pincushion is holding two sets now, as seen in this photo. I was worried there wouldn't be room but I squeezed them in. I had a clean-out of my sewing basket. I found these little cut-out felt strawberries and leaves, left over from an appliqued bag I made for a little friend last year. I was thinking about making a little brooch with them. I've never made one before, though, and I think I need to get some sort of backing to mount them on. But wouldn't it be cute? I can see it on my black coat or even my jean jacket. (I promise that strawberries do not play as hugely in my crafting life as I may have made it seem so far in this post. But I do adore them). I'm still thinking about winter gear for myself. I don't need any more scarves, cowls or hats but I love them, and I'd happily add a few more to the rotation. I work almost entirely with acrylic yarns, as you know, because they're tough and affordable. But I also want to become more comfortable with natural fibers, which feel so much more precious to me. Like the aforementioned Liberty fabric, I feel tentative and anxious about using better yarns. I'm making plans, though. I want to use these colors, in real wool, with maybe another lighter gray and possibly a mustard shade, to make a pair of mittens for myself. If there's enough left, I may make a cowl too. I'm still plugging away with Heartwarmer. It's about two and a half feet long now. 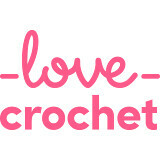 I'm enjoying it, but as with a lot of mindless-crochet projects, I have to be in the mood. Some days are more mindless than others, you know? I'm in no hurry, it's just nice to have it in the background, to work on when the feeling strikes. I shared a photo of this recently but I didn't say anything about it. I'm making a not-so-giant granny square blanket for our good friends' baby. He is expected to arrive toward the end of February. His father is one of the Bear's best friends; they met in college and shared an apartment for a couple of years. He was in our wedding party and is actually the reason the Bear and I met at all - he was dating one of my friends for a little while and they invited me to a party, where I met the Bear. Our friends waited a long time for this baby and I am so happy for them. I debated many different types of blankets and even started three or four, ripping back because I wasn't happy with them. Then I thought - big square! - and now I'm enjoying it a lot. I've just finished reading this book. Have you read Tana French's Dublin Murder Squad series? This is the most recent installment. I loooove her books. I've been a fan since the first one, In the Woods, came out, six or seven years ago. Her writing really draws me in, with very sharp character development and perfect banter. Not to mention murder and intrigue! I rarely buy novels for myself these days, I wait for my turn with library copies instead. I waited for months to read this one. It did not disappoint; she is just really good. I know, I know...I'm sorry. But I found a good sale on stamps and ink pads the other day and I stocked up on a few of each, including these two ominous-looking ones. I confess to thinking about cookies, fudge and festive holiday jam recipes too. Dun-dun-DUNNNN! 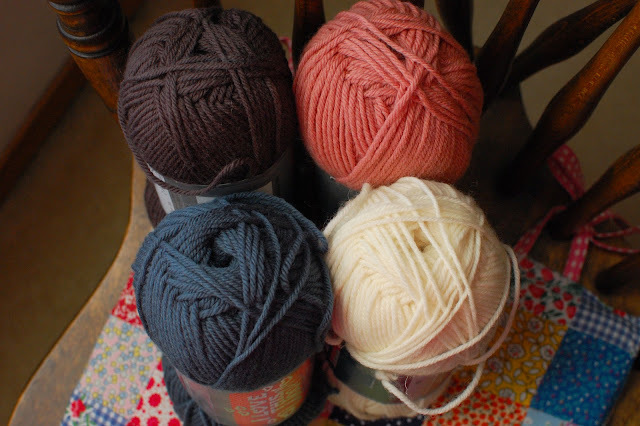 I do love the colours of your yarns, and the ones you're using for that baby blanket. And I know exactly what you mean about using more expensive fabrics and yarns. It's nerve-wracking and I have a stash sitting idly just because I daren't go near them with a pair of scissors! Rowan yarns are my favourite but unfortunately wool has an itchy effect on me (never a problem until I had a baby). Still, I've made a few simple hats and am willing to itch a bit because the colours are just so beautiful! 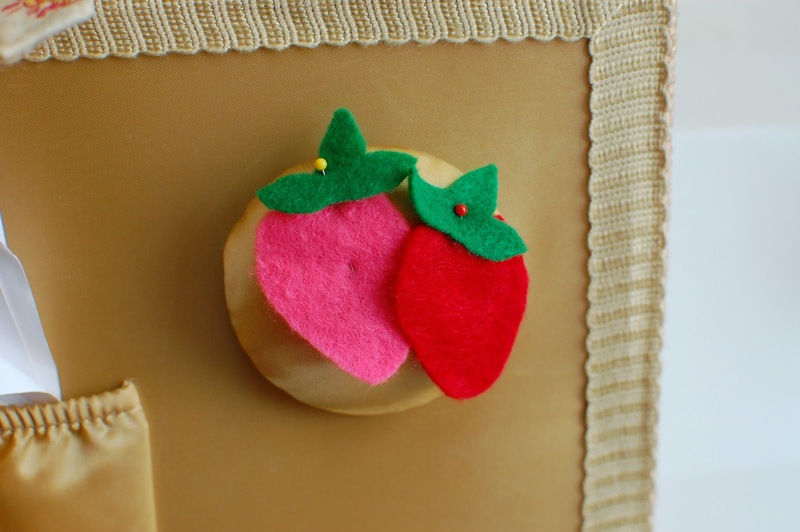 Love the fabric and the felt strawberry it would make a great brooch. 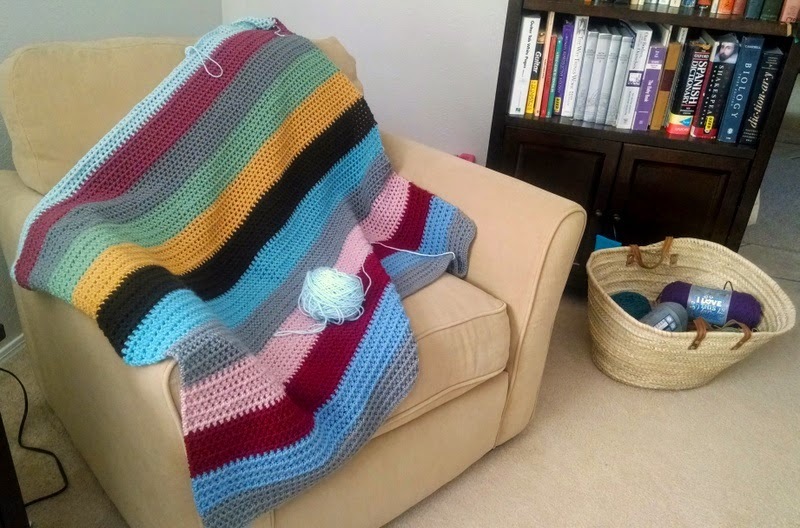 The colour of the yarn for the baby blanket is delightful. Your stamps would make great gift tags. Glad you are on the mend, have a great week. I'm way to wary using more expensive yarns & fabrics. I have a lovely selection of Liberty lawn bought for special patchwork projects but I'm too scared to cut into them, silly really. I've asked Santa for a Sissix machine, if one appears under the tree I shall bite the bullet & get on with it. 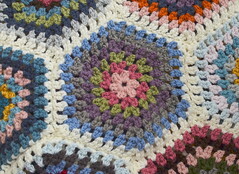 Love your combination of colours for your baby blanket. I'm glad to hear that you have the bugs all beat. All your projects look and sound cool. The baby blanket is particularly lovely. Tana French is on my must read list. Lots of people rate her work. I must admit that I often find crime novels ultimately disappointing. Perhaps I've been reading the wrong ones! Good thing you didn't get really ill - nothing as bad for a household as when "the mother of the house" is "out" due to sickness... On the other hand, it does make the husband/children realize how much they rely on mom for, well, for everything ;-) ! The fabric you are using for your sample dress is really pretty! And be careful with the Liberty; once you have tried it out you will become addicted. Is it just me or are we all gearing up for Christmas and the wonderful festive season earlier than previous years? You certainly have plenty to keep you busy! The Miss Maggie set is currently tucked away in a drawer of mine. I am slowly working on the courage to start. I look forward to seeīng yours all finished. Good idea about doing a test run on another fabric, mental note to self. The color choice in your yarn skeins are gorgeous and I think that the grey and mustard yellow will just add to its beauty. I'm glad everyone is feeling better and that you didn't get too sick. 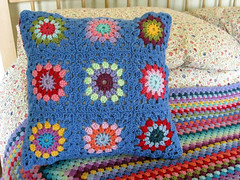 The Heartwarmer blanket is going to be a whopper when it's finished and the not-so-giant Granny square is going to look lovely :) As for using more expensive yarns, just go for it and make something nice for yourself. I love all the things you're making. I'm also making far too many things but mostly they are small and finished quickly. If you use those four colours of wool (and possibly two more) for your mittens then I'm sure you would have plenty left over for a cowl. You'll love working with pure wool - or any natural yarn. 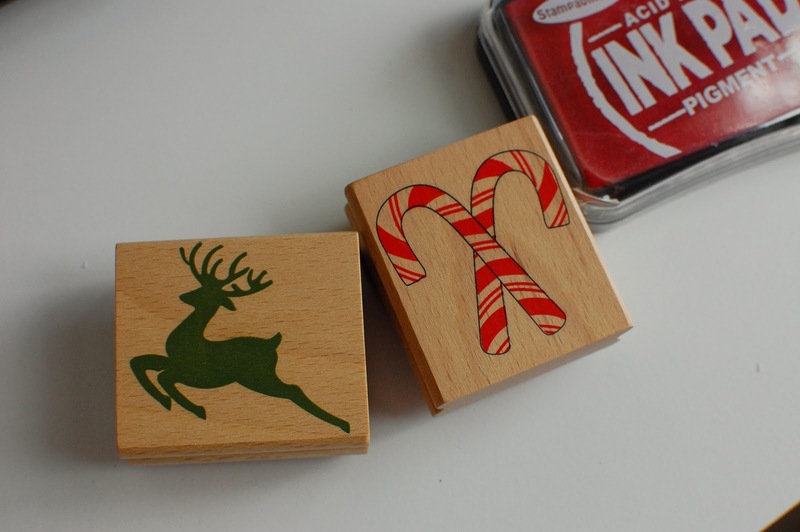 I bought a box of stamps and some ink yesterday for yet more Christmas crafts! So glad you are all well now, Jennifer! It is that time of year when we seem to gather more projects to us than we can handle without being stressed. I just don't know why we do that. That is such cute fabric, and I'm sure you will do just fine. 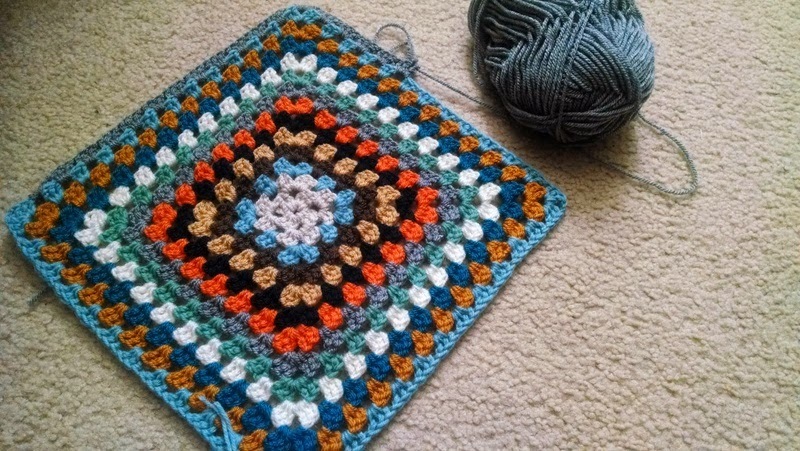 I really like the granny square blanket that you are making. I keep trying but have yet to master the granny square. Yours look beautiful! Glad you didn't catch the illness Jennifer. Pathetic Liberty fabric is so beautiful, I can't wait to sore the finished dress :) Dolly will look very glamorous! I am the same with scarves, I get around my scarf making addiction by making loads for other people as gifts :) Even the men may get one this year! You are brave to make the rabbit and the dress, I haven't made either, I am a chicken as I cannot hand sew. Remember you deserve to work with beautiful yarn, if it is acrylic then great but don;t not treat yourself to something a little more fancy. Blankets are hugely expensive projects so I see the need there for saving there, but a beautiful hat or cowl you deserve to use nice yarn. I'm sorry you were all sick Jennifer, but happy to hear you're on the mend. I haven't fallen onto the Maggie Rabbit bandwagon yet. I think you're smart to practice on the dress first. I would be afraid of making a mistake too-and your little one benefits by getting a new dress for her baby. Everyone wins! Glad everyone is on the mend, it's awful when kids are unwell. You have some lovely projects on the go.